The suburb of dream city Mumbai, Thane has recently grown into one of India’s largest residential hub. Be it for purchase or rent, Thane won’t disappoint you. Coming to the apartment types available here, you will find access to all starting from the luxury suites to economy apartments thereby allowing you to make a choice as per your need and affordability. 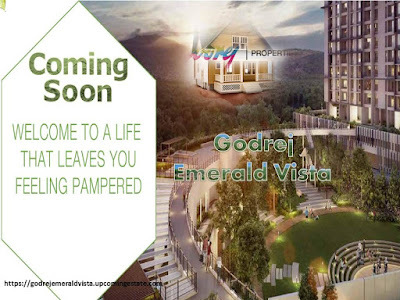 With this zone developing each day as a prominent real estate market, Godrej Properties is set to make its mark with Godrej Emerald Vista, Thane. Covering few acres of land, Project Godrej Emerald Vista enjoys a strategic location in Thane city wherefrom both the western and eastern expressway is easily accessible. This project is also nearby the local market thus making your day-to-day life easier. The thane railway station is at a distance of 24minutes while it will take you just 33 minutes to make way to Borivali Railway Station and 36 minutes to Bhayandar Railway Station. At a distance of just 7minutes, you will find access to metro railway whereas the high street mall will take you 12 minutes to reach. After proper research work regarding the prevailing architectural norms and designing guidelines, the final blueprint of Project Godrej Emerald Vista has been prepared. Special care has been given to each of the apartments. As per your requirement, you can invest in a 2bhk, 2.5 BHK or 3bhk apartments. Here is a detail of the floor size and price. Coming to details about the interior, the bathrooms and kitchen will be having vitrified tile flooring with branded fixtures whereas the bedrooms and living room will be having marble flooring. The walls will have royal emulsion paint also letting you scope for customization. Last but not the least, the array of amenities is what you must be interested in knowing before heading with the investment. Living up to your expectation, Godrej Emerald Vista brings to you amenities like jogging track, swimming pool, kid’s playground, adult park, indoor sports playroom, gymnasium, banquet, community hall, golf course and rainwater harvesting facility. Still wondering? Hurry up and get your booking done. For details about date of acquisition, get in touch with any representative of the developing group.